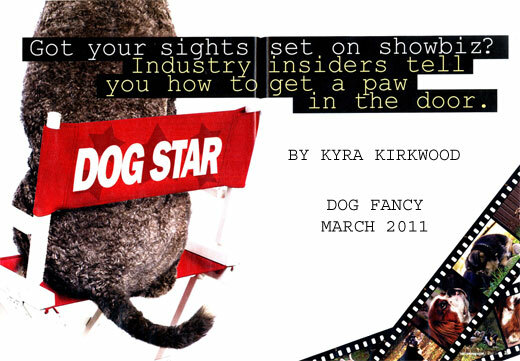 The March 2011 issue of Dog Fancy magazine examines the realities of getting your dog into show business. Is your dog the next star? How hard is it to become a movie dog? Journalist Kyra Kirkwood interviews expert dog trainer and Zoom Room founder Jaime Van Wye on the topic of movie dogs, dog tricks, and the realities of animal actors in Hollywood. For some dogs, a life lived on the big screen or in front of the camera is ideal. But how can you get your adorable, talented canine into show business? It’s not as mysterious as it may seem. Sure, just like any type of showbiz adventure, the competition is fierce and chances are few. But with a few tricks up your sleeve and some knowledge of how the system works, you stack the odds in your favor. Who knows? Maybe someday you’ll attend a red-carpet Hollywood premiere as the guest of the film’s star: your dog! What makes a great canine media star? First, the dog must have the right temperament and disposition to be in front of the camera. Dogs who succeed in print work for magazines, in commercials, on television, or in the mosvies all possess a strong level of friendliness, confidence, a rock-solid termperament, and a willingness to learn. “A dog who is well-socialized and can adapt to strange environments can do really well as a dog actor,” says Marla Friedler-Cooper of Hollywood Dog Stars, based in San Clemente, Calif.
No particular breed does better than others. Mixed breeds and purebreds all make fabulous dog stars, so long as their individual personalities and confidence levels are suited for the work, industry professionals say. A dog doesn’t have to be extraordinarily cute to be chosen, either. Average family dogs or those with a unique look can and do succeed. “‘Cuteness’ is often the last thing that comes up, says Joel Norton, head studio trainer with Hollywood Paws talent agency in Los Angeles. This group has more than 200 production credits to its name. Although a distinctive look can be an advantage, dogs who are extremely different looking – one eye, three legs, massiver underbite – aren’t booked for many job, simply because roles needing those physical descriptions are few and far between, according to canine talent agents. Another must-have trait for dog stars is a high food drive. Dogs who will perform enthusiastically for treats are easier to work with and master the needed skills quickly. “if the dog doesn’t want treats, we can’t make a dog do anything,” Norton says. Age does not matter, but most talent agents will not work with puppies younger than 6 months. Training is vital. Before launching into a showbiz career, dogs should have a good mastery of basic obedience skills: Sit, Stand, Stay, Come. “Having some foundation of training is so important when working with animals on a film set,” says Georgina Bradley, animal coordinator for DogStars Animal Training & Talent in Vancouver, Canada. Even better are the dogs who obey despite many distractions, and respond to their owners’ non-verbal commands (hand signals) from a distance. This is especially helpful on set, when the owner or trainer is located halfway across the room and nowhere near the dog. Although mastering obedience skills is mandatory, acting classes are an additional fun and oftentimes useful training option. Dogs learn Hollywood-type tricks and traits, such as finding a mark (a piece of tape on the floor that indicates where an actor should stand), cocking his head, waving a paw, and even lifting a leg on command without urinating. Many dog-training venues offer acting classes. “We train the owners to train the dogs,” says Van Wye, a master certified dog trainer. That’s a key component to success in canine Hollywood: the owner’s motivation and dedication. It takes work to train a dog, and even more work when training a dog to do complex tricks. Owners must keep up the learned skills, because there’s no telling when Hollywood will call. Just like the two-legged side of Hollywood, the four-legged component is also filled with tough competition. Agents help cut through the fog and connect casting agents, producers, and photographers with dog owners. it’s not totally necessary for your dog to have a talent agent. There are online sites such as the Dog Actors Guild that allow owners, for a fee, to place photos and bios of their budding canine stars in an online database searched by casting directors and others needing dogs for projects. But to get in the face of big-time producers and photographers in Hollywood, it can pay to sign with an agent. Some trainers can help you find an agent. Friedler-Cooper will often refer class graduates to trusted agents, and Bradley of DogStars is approached by productions or other trainers often. Some of her big success stories are Disney’s popular Buddies films, like 2009’s Space Buddies and Spooky Buddies, due out Halloween 2011. But beware; not all agents are legit, trainers warn. Be wary of venues that require expensive headshots or pricey acting classes for your dog to be represented at all. 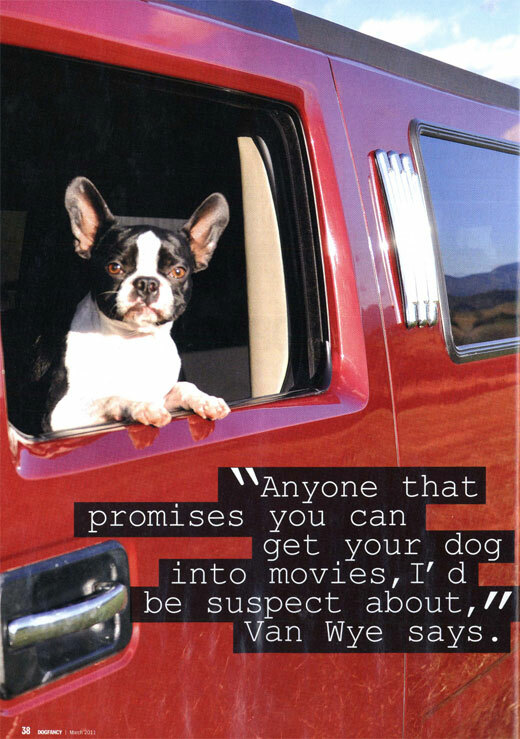 “Anyone that promises you can get your dog into movies, I’d be suspect about,” Van Wye says. Want to try Hollywood success sans agent representation? Van Wye suggests creating a YouTube video of your dog and crafting a website for him. A well-edited package that includes a few crisp, beautifully lit photographs of your dog as well as some video clips can be a good idea, experts say. but there’s no need to invest hundreds of dollars on professional pictures to create a portfolio. Look on Craigslist for castng calls, as many low-budget, local, or student projects can be found there. The pay might not be much, but it’s a great chance to see if you and your dog enjoy this kind of work before launching into Hollywoodland. This route is also helpful is you have a dog with a quirky, unique talent (peels bananas, balances on four posts, etc.) that might not be popular in mainstream Hollywood, but may have a place somewhere else. Also, as an owner, keep your expectations realistic. Shoots may take all day, and the dog might earn a few hundred dollars. It’s a lot of work without a huge payday. If it’s not fun for both of you, if you’re not comfortable around strangers, or get antsy during downtime, it may not be an ideal choice, trainers say. On the other hand, if you have a dog with star potential, it may be worth the work to see Fido up on the big screen. After all, it is Hollywood, the place where dreams come true. I have a 3 to 4 year old Terrier Mix named Winston that came to me 2 1/2 years ago. He has a very calm disposition and has won numerous photo shoots, contests, shows, etc. He is a Camera ham and loves people, kids,and animals. He has huge big brown eyes like a humans eye, and is so cute, I would like for the world to see him,fall in love with him and smile, just the same as I have, but an not sure what I need to do to get him into the studios. Could you please call me anytime and let me know what I might need to do(805)844-8649? Thank you so much for your time and I look forward to hearing from you soon! I HAVE A 3 YEAR OLD NEWFOUNDLAND CROSS BLACK MALE. EXCELLENT WITH OBEDIENCE ALL AROUND AWESOME DOG, WAS A RESCUE SO HAS PERSONALITY AND IS SO VERY GRATEFUL ! HE WOULD MAKE THE PERFRCT MOVIE DOG ! i have a puppy and im interested but do u have any upcoming ones perhaps 2013?? I would like to see more Great Danes in movies. I have a very large, very fluffy, tri-colored 2nd gen Labradoodle. I cannot take him anywhere unless I have a lot of time — It is like travelling with a rock star. Everyone stops and stares, asks questions, and asks to take pictures. He is extremely unique and quite a charming character, everyone tells me that he should be in movies and commercials. I’m just checking into it to see what it would take. He get so much attention, he is definitely memorable. Thank you, Dave. Hi, I have a Rottweiler mixed with beagle he is 4 Years old but has a puppy face which everybody says we are currently looking for a model/acting agency, He has the perfect temporment and he is so photographic generated He does know how to sit, stay, laydown , Shake, and jump.he is 60 pounds and is black,white,and brown. He has the rottweiler body color but has a big white patch on his chest with a few black polka dots then he has the beagle ears and paws. Hugo is a very large and majestic red and black German Shepherd . hugo is very attentive and eager to please. hugo has an incredible and outgoing personality and is extremely obedient. Hugo gets along well with animals of all species. hugo has a crush on kitty cats!!! Yes, Id like to find out about the acting class for my yorkie/papillion. When classes start and how much are the classes. Thank you! I have a beautiful Shafershire so handsome u need to see him. let me know if you want me to send pics. Read more posts about "Dog Movies"